MONTREAL, Canada, February 14, 2014 (ENS) – “Today there are an estimated 639 bicycle-sharing schemes operating in 53 countries located in almost every region of the world, boasting a total of about 643,000 bicycles,” bike-sharing expert Peter Midgley writes in a new blog post for EMBARQ, a program of the environmental think tank World Resources Institute. Thirteen years ago, there were just six bike-sharing systems operating in six countries: Denmark, France, Germany, Italy, Norway, and Portugal, with a total fleet of over 4,000 bicycles. The largest of these schemes was Copenhagen with 2,000 bicycles. Today, bike-sharing systems are zooming in popularity. But one major North American city has not succeeded in establishing its bike-sharing system on a firm financial footing, writes Midgley, who worked as the Urban Mobility Theme Champion for the global Transport Knowledge Partnership, after a long career at The World Bank. Five years after opening the Bixi bike-sharing system, the Montreal-based Public Bike System Company (PBSC) has accrued a debt of around $50 million. On January 20 Montreal Mayor Denis Coderre announced that Bixi is insolvent and it has filed for bankruptcy protection. The Bixi system looked good at the outset with its convenient payment dock and removable modules that made it easy to service the bicycles. The system was popular with cyclists, but it was plagued with problems. “The Bixi system’s failure was not due to a lack of interest in bike-share programs but from a large number of companies wanting to compete in the bike-share space,” Midgley explained. Although he says Bixi’s failure was a “surprise” for many in the bicycle sharing community, PBSC has been in financial decline for years. PBSC posted a $6.9 million shortfall in its first year. In 2011, the City of Montreal bailed the company out when it was near collapse. The city lent PBSC $37 million to cover its deficit at the time and also made $71 million in loan guarantees for international expansion. And Bixi has expanded. The public bike-sharing system is up and running in 10 locations across the world, with over 37,000 bikes shared from 2,676 stations. But several of these cities now are withholding payments following legal disputes, software issues, and delays. PBSC had promised the city of Montreal that sales of the Bixi system to other cities would finance Bixi’s bike-share operations. Now, Montreal’s auditor has recommended that the company sell its international operations, because the law forbids Quebec municipalities from running for-profit businesses. In fact, Bixi is officially up for sale with a deadline for bids of March 10. The sale is being coordinated by Richter Advisory Group, the court-appointed trustee. The bike-sharing company is selling everything other than its Montreal operations, and the City of Montreal is taking over the local operation of the service. Mayor Coderre said he plans to make an announcement about Bixi’s future within two or three weeks. In January PBSC tried to provide some continuity by assuring cyclists who had purchased a subscription at the end 2013 for the 2014 season that they will be able to use it at the beginning of the season in April 2014 after the snow melts. To make matters worse, Midgley says, the Bixi system’s owners got into a legal dispute with their software supplier, 8D Technologies, and had to hire another company to replace the software. 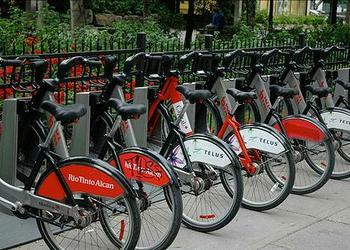 This litigation delayed the installation of bike-sharing systems in New York City and Chicago. Alta Bicycle Share, the provider of the Bixi bike-share system in Portland, Oregon, asked Bixi for $11 million in damages for software delays. But now Alta Bicycle Share is forming an alliance with 8D Technologies to sell bicycle-sharing systems throughout the world. “This will combine the software, electronics and docking stations capabilities of 8D Technologies with the operating experience of Alta to develop the next bicycle-sharing generation,” Midgley explains. The “fourth generation” bike-sharing systems include movable and solar powered docking stations, mobile phone real time availability information and electric bicycles, known as pedelecs, that attract older users and enable bike sharing in cities with steep terrain. Yet 59 bike-sharing systems have closed in the past year, many of which were located in Spain and other countries hard hit by the global financial crisis.